You are here: Home » Blog » Real Food » Recipes » Limeade Popsicles: Easy and Refreshing! Limeade Popsicles: Easy and Refreshing! Who doesn’t love limeade or lemonade in the middle of a hot, sunny day? The other week, I picked up a bag of discounted limes from the produce market, and had sort of forgotten about them. In the midst of “one of those mornings”, I decided that the kids and I just need to just stop doing our cleaning chores, have a little fun and enjoy hanging out together. I remembered the bag of limes sitting in my fridge drawer and was suddenly inspired to create a recipe for Limeade Popsicles, instead of our standard yogurt/fruit smoothie ones! This would have made 2 or 3 trays of popsicles, but I only have 1 tray. 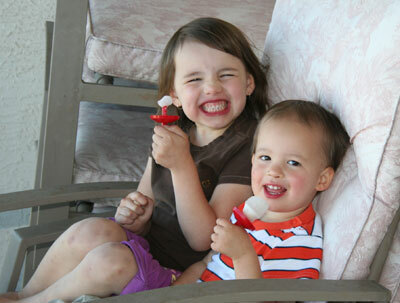 So… we made a tray of popsicles and Mommy enjoyed iced limeade while she blogged! 🙂 It you only have 1 tray like me, definitely cut these amounts in half or simply do as I did and drink the yummy excess. What types of popsicles do you enjoy making? The looks on their faces say it all! Yummy! I am a new reader and really enjoy your blog! We like to make watermelon popsicles. We just throw chunks of watermelon in the blender and pour the juice into the molds…delicious! Andria, that’s such a yummy idea! I love it! What type of mold do you have? I have used the ones with and without the ridges on the stick and every time I go to unmold them the stick just pulls out, even if I run them under warm water first. Our standby, winter or summer, are smoothie pops. Cool idea about watermelon! I will have to try that. My 3 year old LOVES popsicles. We have the same molds it looks like! Normally we do fruit juice ones. I just combine some fruit juice concentrates- like pineapple/orange, and add water, and freeze. Its simple…but today at my friend’s house she had some that she made by pureeing strawberries, raspberries, some water and a little maple syrup. They were good! I liked the idea that they still had the fiber in there from the fruit. Our favourite- 5 TBS orange or pineapple juice concentrate to 2 cups yogurt, plus 1 tsp vanilla. I always make orange juice popsicles. Just orange juice. They tase great. I make goat’s milk and berry popsicles… creamy, berrrilicious and good for you! fresh organic strawberries, blueberries, etc. blend it together and freeze! I have been using leftover smoothie to make popsicles and recently made some Strawberry Lemonade popsicles…which were a hit! I bought several jars of organic strawberry/mango lemonade for .75 ea. This was a great (and frugal) treat for a hot day! These are all such great ideas! I loved the limeade one and also the smoothie ideas. My sister and I enjoy freezing go-gurts to make frozen yogurt and we also like making Blackberry Tea Pops. We just pick about1 cup of fresh blackberries and get 2 cups of cooled earl grey tea, 5 tablespoons of sugar, 1 teaspoon freshly squeezed lemon juice and 1/2 teaspoon of freshly squeezed lime juice. Blend and puree the blackberries; strain them then whisk the tea, sugar, juice and blackberry juice together and freeze. Yum.